Was used as a decoy airfield for Docking between 1 January 1942 and 18 June 1942, but was then abandoned. In 1943 work commenced on creating a modern airfield for 3 Group, Bomber Command to be used as a sub-station for Foulsham. The airfield was transferred to 100 (Bomber Support) Group in December 1943. At that time the runways were lengthened to turn it into a very heavy bomber base. Plans changed and instead Lakenheath, Suffolk was used. 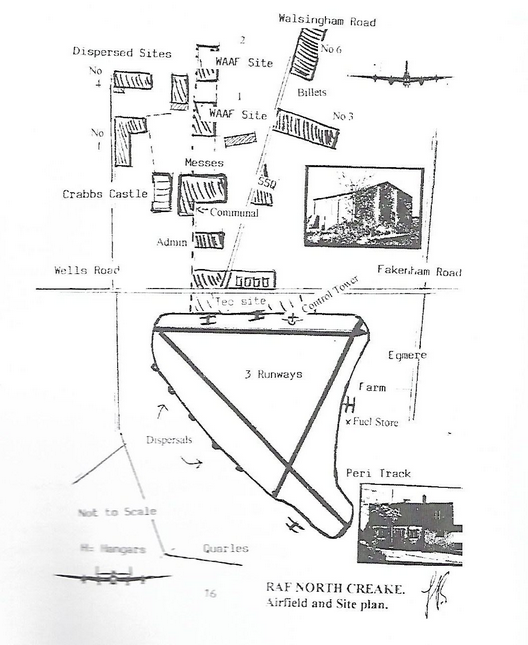 In spring 1944 a further change of plan turned North Creake into a fully operational airfield. Most of the airfield lays within the parishes of Great Walsingham and Wighton, and it was and still is referred to by the local as Egemere. At the end of 1945 it was no longer required and was used by Maintenance Command to store surplus Mosquito aircraft, these were gradually scrapped and the airfield closed in September 1947. So many of the old airfields now stand barren, or are back to agriculture use with no resemblance to the past secret activities, hustle and bustle that went before. In fact, in many cases some people still do not know the 100 Group and the many airfields in Norfolk ever existed, such a shame when without them our lives today may never have been the same. For too many visiting veterans this has become disheartening, after all they saw many comrades come and go, some never to return. Many have questions unanswered, never knowing what happened to their friends and family, like the Stirling III LJ536 EX-P that took off from this very airfield, and never returned, missing without a trace, and unfortunately this was not an isolated case. Many dedicated themselves to the cause, leaving their own home countries, family and friends behind them. Everything once familiar to them was put on hold. Some spent many years of their lives here, so to now not see any resemblance of that past life must be hard, they must feel along the way they have been forgotten. However, RAF North Creake is different, and is actively bringing history to the forefront in both a way where the past can be remembered and new memories gained. It is a pleasant change to write about such a base, where the Control Tower has been restored as a B & B giving a unique experience of being able to relive history - http://controltowerstays.com/. It is also actively pursuing a goal to put in place a memorial sculpture with their ‘Time to Remember’ – RAF North Creake Memorial Project. So, this base is really different in that it has a place both in the past and the future, with its core foundations never being forgotten. I much admire their work and hope one day to be able to stay in the tower to get the full experience myself. Although RAF North Creake was the official name given to this airfield the local Norfolk residents did not agree and saw this as an insult so instead it was locally known as Egmere Drome. 1940 saw the first military presence at the site with the arrival of the 57th Heavy Newfoundland Regiment of the Royal Artillery for coastal defence duties. Their arrival must have caused quite a stir with the locals, as they came with two giant 9.2inch Howitzers. After that regiment left, a British Army regiment occupied the site, and a number of Land Army girls lived in the Farmhouse. If you want to know more about the experiences of the Land Army girls then the article below is an interesting read and gives you a good insight into the area at the time. The site was situated five miles north-west of Fakenham, construction starting in 1942. It was previously an area of farmland known as Bunker’s Hill, the land being owned in the main by nearby Holkham Estate. Constructions plans were said to have changed twice but you can see from the site plan how the base eventually took shape. In December 1943 it was passed to the No. 100 Group and on the 1st April 1944 , F/Lt J.I.Harris MC arrived to assume command shortly followed by the arrival of other personnel. On the 28th April, the AOC commanding 100 Group, Air Commodore E.B Addison CBE, visited to inspect the airfield and personnel. At that time this consisted of No.199 Squadron, 50 RAF Regiment personnel and 7 WAAFs. During the time the 100 Group was based in our region terrible winters were endured, and life at times would have been very hard, suffering through the freezing temperatures being accommodated in cold Nissen huts with fuel rationed. On the plus side comradery was a key to bringing everyone together. Facilities at the base itself saw a new Mess bar opening on the 18th June where parties and dinners were held, occasionally visited by the Earl and Countess of Leicester. There was also a well-equipped library and reading room plus facilities on site for cricket, tennis and swimming, of course for the well awaited warmer weather spells. These warmer months would bring problems to, and on the 30th June torrential rain and thunder flooded both the WAAF and Accounts sites. If that and war was not enough, they faced another invasion with earwigs, beetles and a whole army of insects making the site their home. Being familiar with the area myself and often in my youth taking a jaunt down to Wells with my friends to escape an afternoon at College (tales I care not to expand upon), I was surprised to hear that in fact the area around the pine woods were harbouring some rather unpleasant inhabitants. Flt/Sgt John Rees, Medical NCO discusses this in Janine Harrington’s publication, RAF North Creake, A Brief History. The squadron first formed in November 1917 at East Retford and disbanded at Harpswell in June 1918. During this time its duty was a night flying Training Unit. The Squadron reformed on the 7th November 1942 as a heavy bomber squadron in No.1 Group Bomber Command. Being based in the Lincolnshire area it was initially equipped with Wellington Mk 3s followed by Mk 10. Between June 1943 and April 1944, it was based at Lakenheath joining No.3 Bomber Group. During this time the Wellingtons were replaced by Short Stirlings. The group carried out a number of dangerous and secretive missions, from night bombing and mine laying operations to the special secret work of supply dropping for the French Maquis Resistance Fighters. You can only imagine the tension during these missions, being guided in by torchlight to drop supplies with pinpoint accuracy, whilst trying to avoid detection or alerting the enemy to those brave souls on the ground waiting. Let alone can we even begin to imagine the thoughts of those hiding in the undergrowth and ditches. Hearts beating faster, eagerly and desperately waiting to hear the distant sound of a plane but also filled with fear and the apprehension that they could be discovered at any moment. They also put their lives on the line and by all accounts these supply drops must have been vital to their survival. On the 1st May 1944 the Squadron moved to North Creake to join No. 100 Bomber Support and were equipped with brand new Stirlings fitted with Mandrel. They were now going to be part of the new electronic warfare era which was to become so vital to us all. The first Mandrel jamming operations took place on the eve of D-Day. This may have come as a bit of a surprise for the personnel involved who were relaxing enjoying a film at the local cinema in Wells. The film was interrupted by a large message on the screen requesting all personnel to return to base. Squadron operations continued until the final Bomber Command raid by the 3rd May 1945. The Squadron was formed at Gatwick on 15th June 1942, equipped with Tomahawk’s and Mustang’s and disbanded December 1942. 8th September 1944 No.199’s ‘C’ Flight was used to reform the squadron No.171. The purpose being to boost No. 100 Group’s radio counter measures capability from North Creake. Initially starting with Stirlings the group eventually converted to Halifaxes. It is important to note that No. 199 shortly after also converted to Halifaxes, making 199 the last Squadron with the Stirlings. Final sorties were flown from the base on the night of May 2nd 1945. In total the two squadrons lost 17 aircraft during operations, 8 Stirling and 9 Halifaxes. After the two squadrons disbanded the site was used for aircraft storage of Mosquitoes until the RAF left the site in the Autumn of 1947. Like many other bases the land then went back into agricultural use. However at least with this base the history can live on. Like many bases it suffered losses, and hardships but in many ways has left a legacy. None more intriguing than a mural of an aircraft that was found on the internal brick wall of the original Flight Office being used as a storehouse at the time by Seamans a local animal feed company. 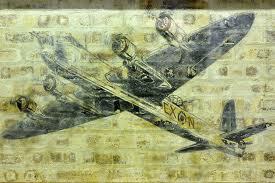 The mural depicted the Stirling LJ531 EX-N which was lost without trace on the night of the 16th June 1944. John Reid a member of the RAF 100 Group Association was instrumental in managing the removal of the wall so that the mural was not damaged and in fact can be seen today at the Bomber Command Museum, RAF Hendon London. The mural was painted by Flight Sergeant Claude “Ted” Allen of No.199 Squadron and in fact a second mural depicting a Stirling Mk III LJ525 EX-R “Jolly Roger” was also found. We are still on a journey of discovering the past, some of which will never know but hopefully the past will continue to overlap into our present, ensuring that those who paid the ultimate sacrifice will never be forgotten.